You might not like the $95 annual fee, but if you love saving money on travel, the British Airways Visa Signature Card from Chase is worth the price of admission. The annual fee is a small investment, considering what you get out of this product. Such perks include an excellent sign-up bonus and great earning scheme. Plus, you get one of the best frequent flyer programs in the world, with a global reach that goes beyond flying on one airline. No matter where you go in the world, Avios – the British Airways Executive Club currency – will help you get airborne even if British Airways doesn’t fly there. Not everything about the British Airways Visa Signature Card –and the airline itself –is peachy, but savvy globetrotters know how to thrive on the “good” and steer clear of the “bad.” You can use Avios on other airlines around the world, including American Airlines in the U.S. and Canada, Alaska Airlines to fly to Hawaii, LAN Airlines in Latin America; British Airways or Aer Lingus in Europe, Cathay Pacific in Southeast Asia, Japan Airlines in Japan, and Qantas Airways in Australia. If you don’t mind doing some research, you can learn how to redeem Avios wisely. This helps you maximize the benefits and minimize the cost. Redemption begins with just 4,500 Avios, or 7,500 Avios for flights originating or terminating in the U.S.
Rather than a traditional points-based sign-up bonus, the British Airways Visa offers cardholders 4 Avios per dollar on all purchases made in the first year (up to $30,000). If you are able to meet the full $30,000 spend cap in the first year, this bonus has the potential for incredible value – up to 120,000 Avios total. Depending on how much you put on the card, this is among the largest sign-up bonuses among airline rewards cards. The British Airways Visa Signature Card earning scheme is above average as well. You earn three points per dollar on British Airways purchases and one point per dollar on everything else. If you frequently buy tickets on British Airways, you will rack up a substantial number of Avios in no time. The Travel Together Ticket is a companion pass you earn each year after spending $30,000 on the card. This is a high spend requirement that cardholders may not be able to reach, but it’s a valuable perk if you can meet the threshold. It entitles you to a complimentary ticket for your companion when you book a flight with Avios. Of course, it’s not really “free,” because British Airways is known to add huge so-called “carrier surcharges” to your award ticket, equaling up to $1,250 per ticket. There are other restrictions as well. You have to fly round trip from the U.S., and the companion pass is only valid on British Airways. Still, the Travel Together Ticket can be a terrific value, especially for flying business or first class on a special occasion. The card comes with a variable annual percentage rate that is on the high side, even for an airline rewards card. 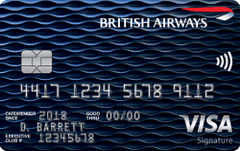 As is the case with most rewards cards, the British Airways card is not designed for cardholders with revolving balances. If you do not intend to pay off your balance each month, you would be better served by a card with a low APR. Aside from the generous bonuses and the companion ticket, the card doesn’t come with any special airline perks, such as free baggage or priority boarding. Still, it does include some useful benefits, such as car rental insurance and concierge services. Notably, the card doesn’t charge a foreign-transaction fee. You can use the card abroad without having to pay an extra 2 to 3 percent for the convenience, and earn some extra Avios along the way. Why get the British Airways card? You frequently fly British Airways, or one of its partners. You want to take advantage of the British Airways Visa Signature Card’s sign-up and spending bonuses. You are planning a special trip in a business or first class and want to earn a companion pass. Try and meet the $30,000 spend cap (or put as much as you can on the card) in the first year to take advantage of the sign-up bonus rewards rate. Since British Airways Executive Club is a distance-based program, try to redeem Avios on short- and medium-haul nonstop flights for the best value. Avoid redeeming Avios on British Airways for long-haul flights due to the excessively high “carrier surcharges.” For flights to Europe, redeem Avios on Aer Lingus or Air Berlin.